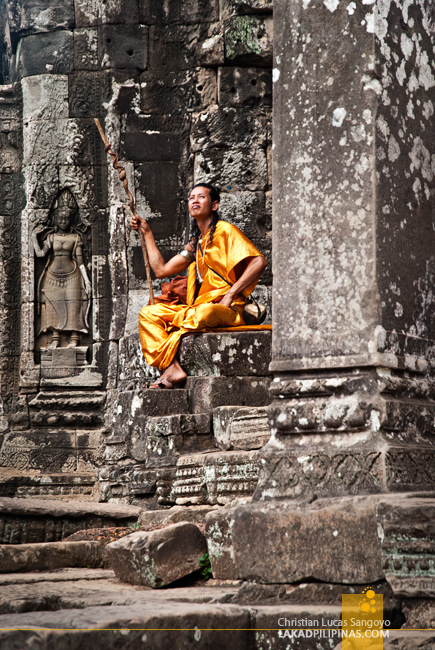 A man carrying a twisted wooden staff and wearing a shiny golden dress emerged from one of the stone towers of Prasat Bayon. I doubled-back, are we on a movie set? 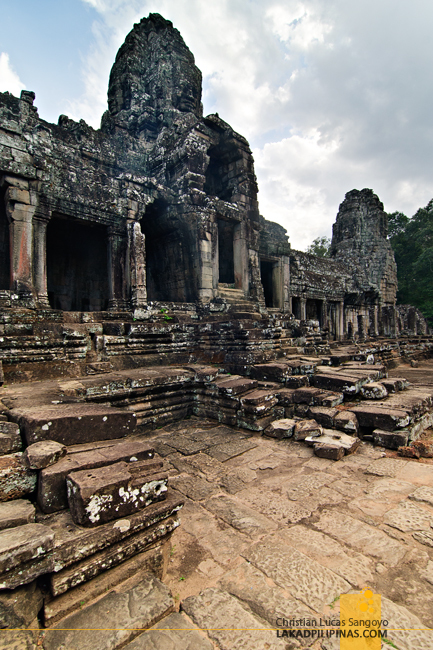 We were on our last leg of our Angkor Thom tour. Having previously visited three out of its eight major sites, we were dead tired. That weariness, however, quickly wore off as we emerged on the upper deck of the Bayon temple where massive, serene stone faces greeted us. 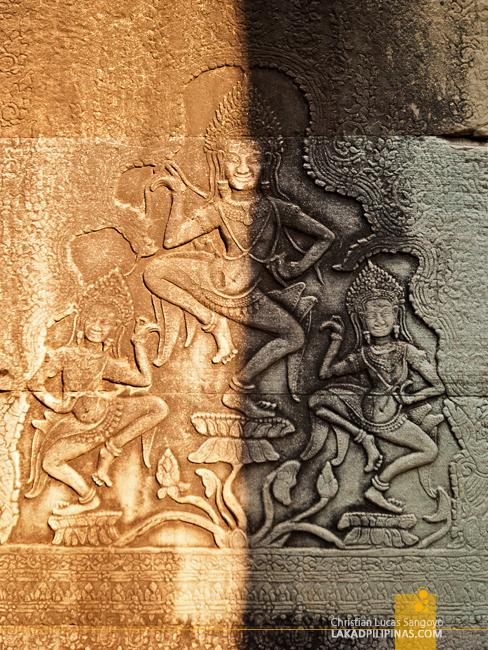 The sun was at its brightest as we went out from the makeshift eateries near the Leper King Terrace inside Angkor Thom’s enormous complex. 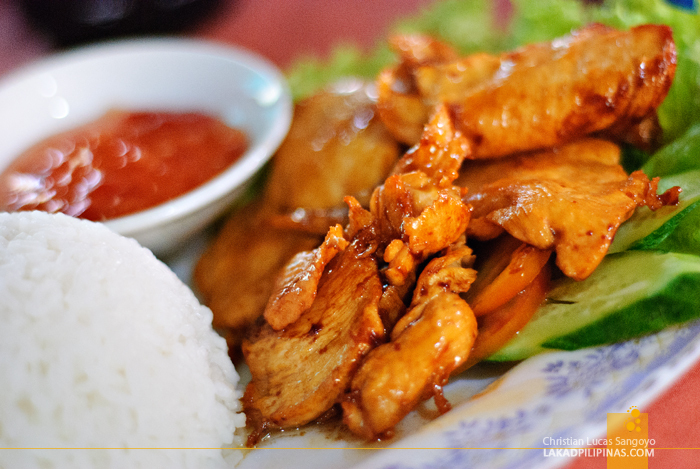 We’ve had our fix of lok lek for lunch and were rarin’ to do the daunting Angkor Thom tour. The complex covers an area of 145.8 hectares; it was simply impossible to do this on just one afternoon. We crossed the road and a huge wall filled with stone carvings greeted us. We wended our way through a mini-labyrinth, both sides of the passageway littered with intricate reliefs. My mind was buzzing; I don’t think human hands are capable of building anything like these. 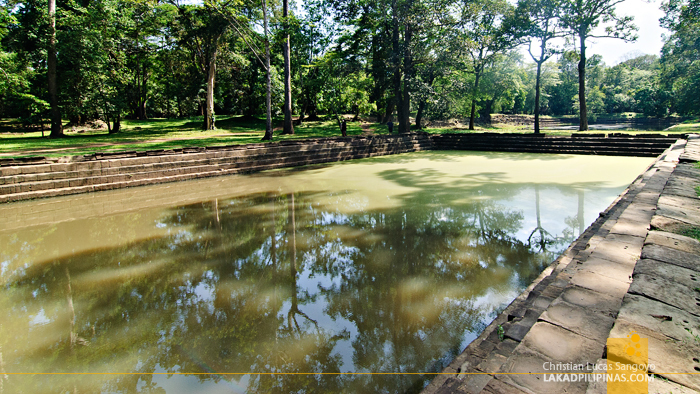 We emerged on an open field with a large mossy pool; the Sras Srei. Measuring 125 meters long and 45 meters wide, this is the men’s pool back in the day. There is a nearby smaller one built for women. It is speculated that early Khmer people used this for water sports. A massive gopura or gate swallowed us as we proceeded along the grounds of Angkor Thom, leading us to our first temple in the Great City, a city once covered in bronze and gold, the Phimeanakas. 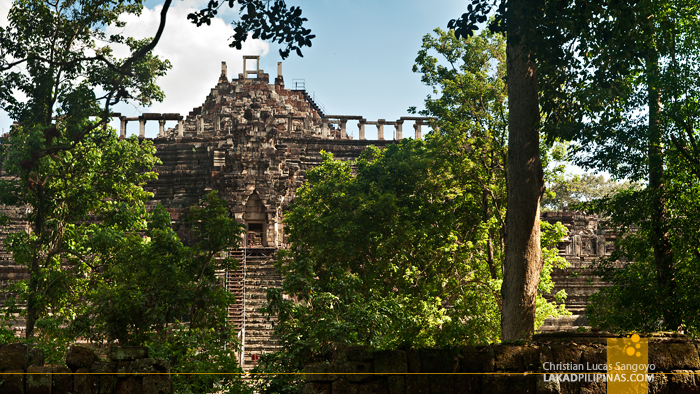 Sitting on a forest clearing is the pyramid-temple of Phimeanakas, the celestial temple. 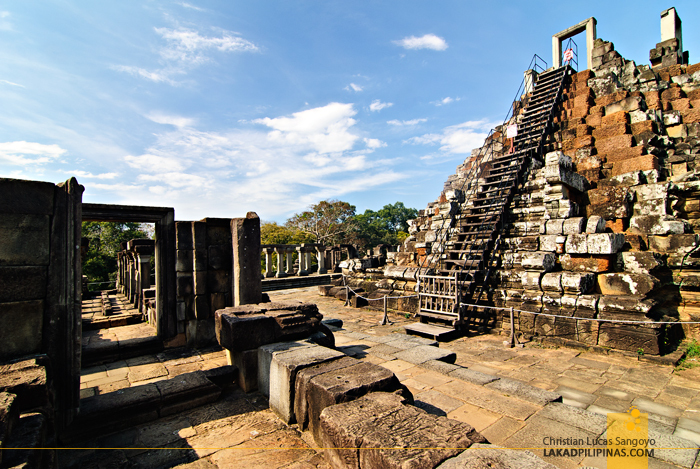 It is a Hindu site made in the Khleang style with simple lintels and a central kala. 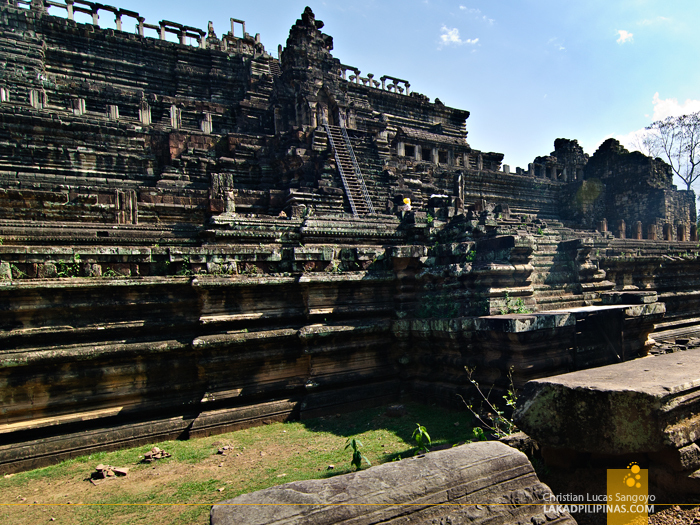 It was built by King Rajendravarman at the latter part of the 10th century and was rebuilt by King Suryavarman II into its current three-tiered form. It was said to have a gold pinnacle during its time. 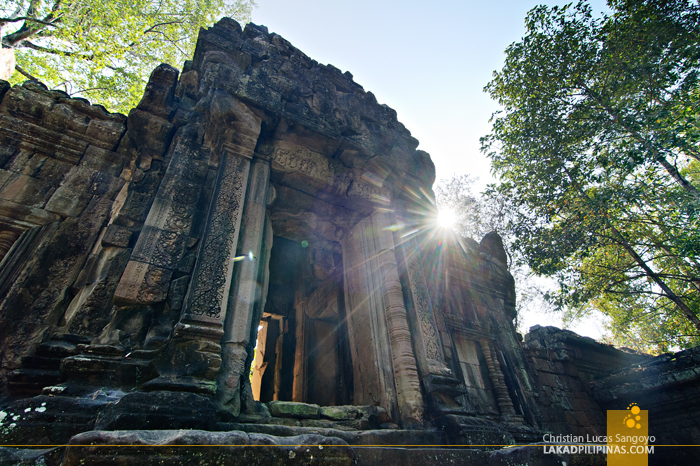 Legend has it that Phimeanakas have been used by the king to wait for the Nāga, a serpent-like mythical creature with nine heads who was the supreme owner of all Khmer land. This creature was represented by a woman who went with the king on the tower every night. Well, we didn’t have no Nāga with us, but we did climb the steep steps towards the pinnacle of Phimeanakas. 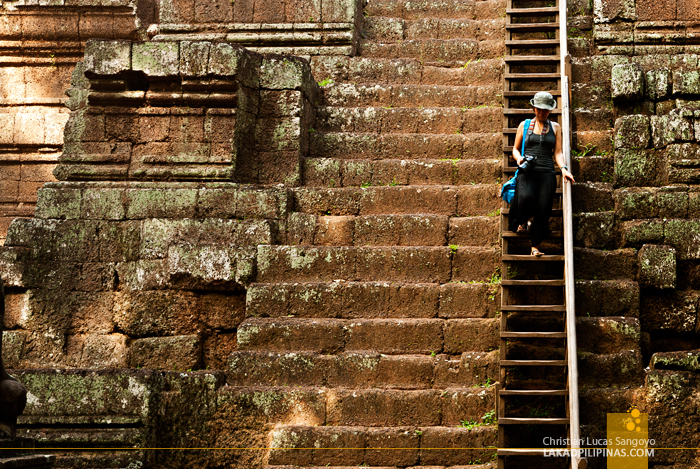 And like most Angkor temples, its steps were built for giants. It was a good thing that the authorities maintaining the area built a wooden stairs befitting a more humane scale. At the top, the golden spire was missing. All we could see was a jumble of stones forming another mini-pyramid. Alright, time to go back down. Hmm… It was actually easier to go up, the way back down was dizzyingly steep. From Prasat Phimeanakas, it took only a few minutes of walking under the thick canopy of Angkor Thom to visit our next temple; Baphuon. Dedicated to the Hindu God Shiva by King Udayadityavarman II, it is immense compared to the previous temple-pyramid we visited even although it has that same three-tiered approach to its structure. It was built during mid-11th century and has gone through two restorations, lasting 51 years before it was finally opened to the public on April of 2011. 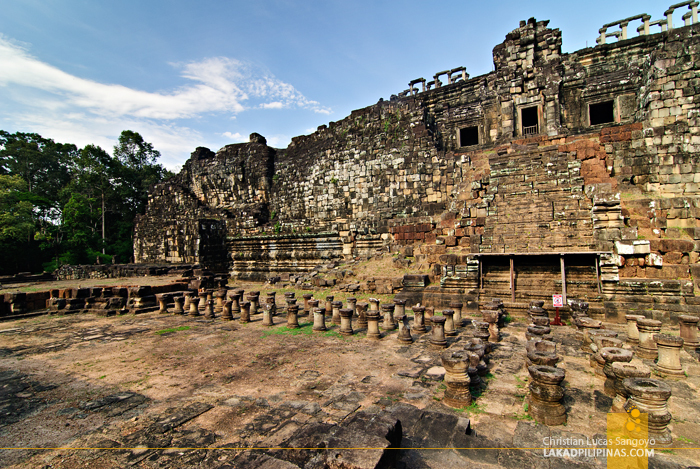 Baphuon was once described as a tower of bronze. It rises to a great height of 50 meters, with its upper base 34 meters high. During our first visit, we were so exhausted with our Little Circuit Temple Tour that we passed off on climbing the temple. It was only on our second visit that I got to see what’s up there. 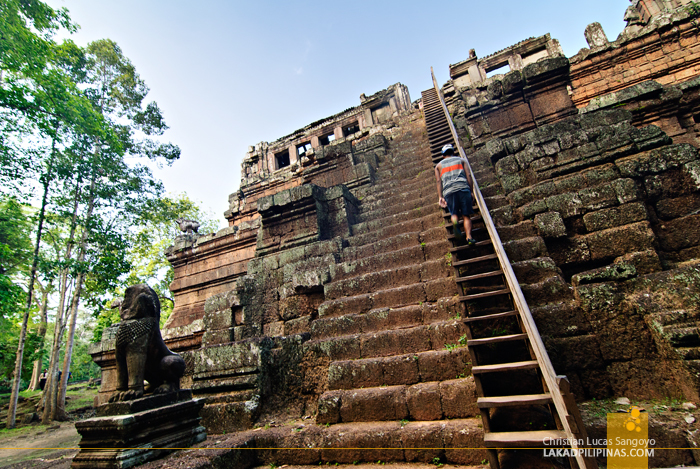 Similar to Phimeanakas, wooden steps were set in place to allow non-gods to ascend the steps with ease. Still, it was an effort to climb all the way to the top, with the searing afternoon heat and all. If you’re planning to climb, please wear proper clothing; that means no sleeveless shirts or blouses. We went around the temple’s never-ending corridors, went up when we could find stairs, and followed the ever confusing way of visit signs. After loosing what seemed like buckets and buckets of sweat, we finally made it to the top; the platform top. Where we found another set of stairs. And we climbed on. 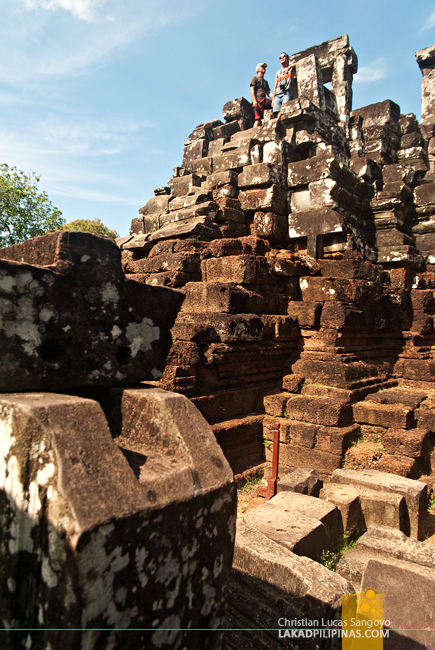 But is it worth climbing Baphuon? At the west side of the temple’s second platform is a 70-meter long reclining Buddha. At first, it all seemed like a jumble of misshapen stones until the sun hit it a certain angle and the figure popped from the stones like a three-dimensional puzzle. 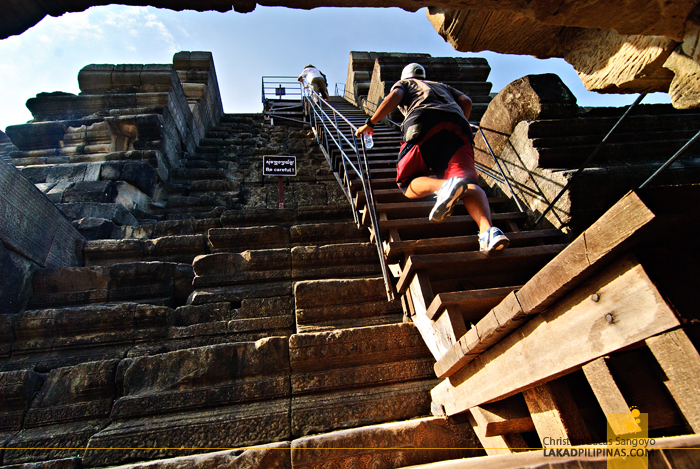 It is worth climbing Baphuon if only for this. On our way out, we passed a long, elevated causeway leading out of the temple and into another open field with greens on both side. 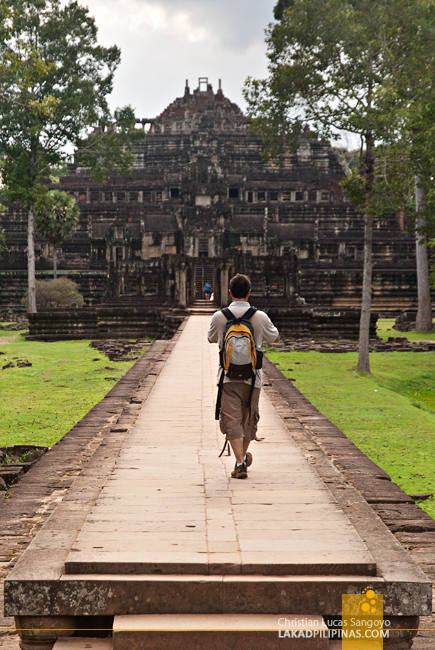 We walked alongside tourists and local monks, en route to the center of Angkor Thom. This is the temple that confirmed what was in my mind all along. This place is made by ancient aliens. 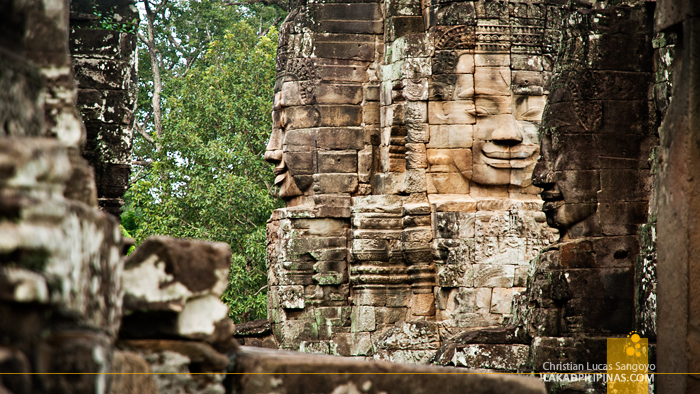 Built in between the 12th and 13th century, Prasat Bayon is the grand masterpiece of Angkor Thom. From afar, it doesn’t look much. 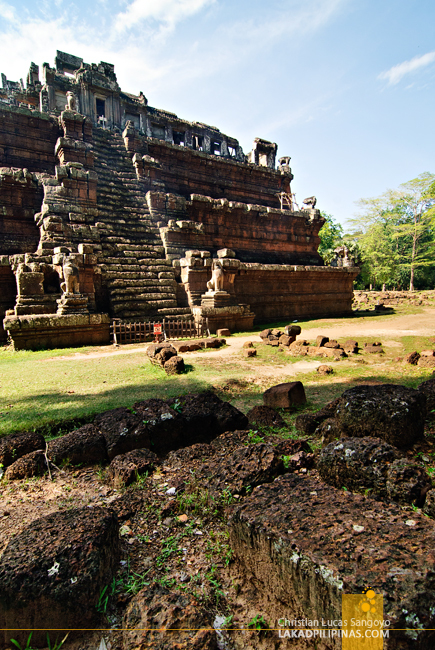 It seemed like your ordinary Angkorian temple (well, not that they’re ordinary but there’s just so much of them). But once we climbed its platform and entered its premises, our weariness immediately transformed to wonder. 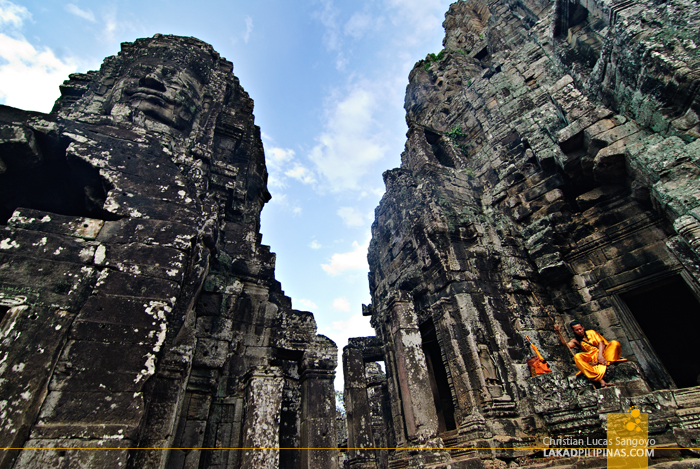 Bayon was the official state temple of the Mahayana Buddhist King, Jayavarman VII, and stands right at the center of Angkor Thom. It’s a shrine dedicated to Buddha, which was later modified by succeeding kings when the religion reverted back to Hinduism. 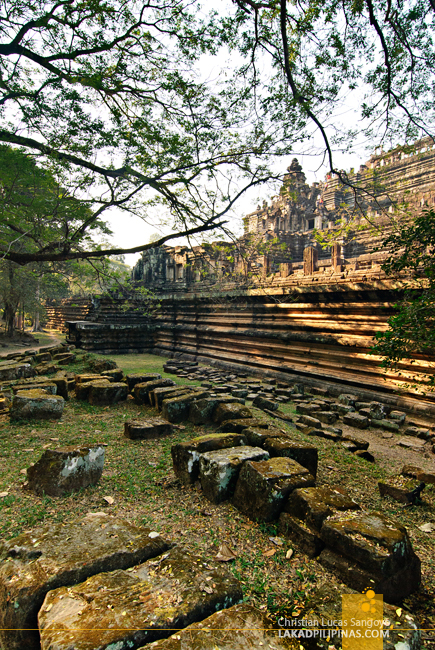 The temple is divided into three major parts; the outer gallery, where bas reliefs can be found showing historical events and scenes from the ordinary life of the Khmer people. 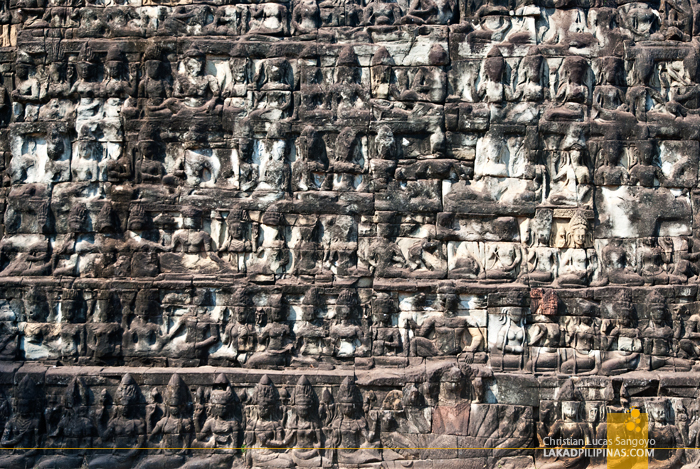 The inner gallery, depicting scenes from Hindu mythology; an addition most probably after the Buddhist King’s reign. And then there’s the upper terrace. Two hundred gigantic faces with eyes closed, lips smiling, will assault your senses. I haven’t seen anything like it during our previous days in Siem Reap. Most of these are carved on a tower, with four faces peeking from each point of the compass. There are speculations that the faces are modeled after the Buddhist King, Jayavarman VII, who relates himself to the Lokesvara or the bodhisattva; one who embodies the compassion of all Buddhas. 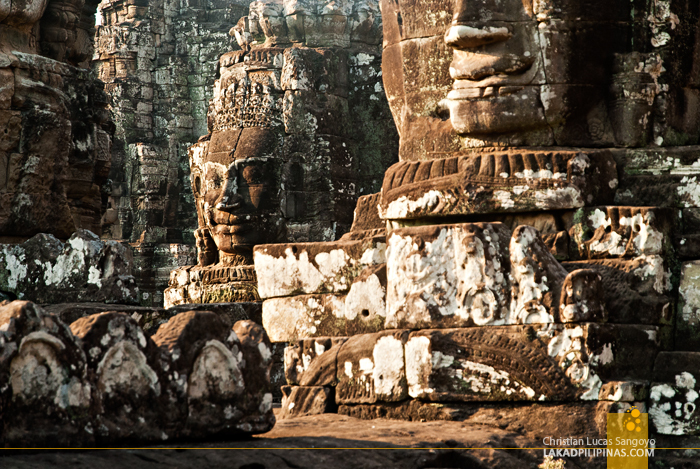 The final part of Bayon Temple is its central tower which rises 43 meters from the ground. Here, a 3.6-meter tall statue of Buddha once resided before it was smashed to bits by the Hindu kings who came after Jayavarman VII. 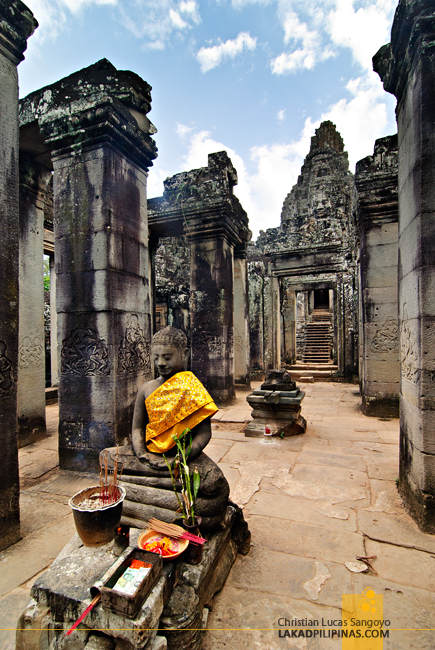 It was fortunately recovered in 1933 from a well, and is now sitting on a pavilion in Angkor. 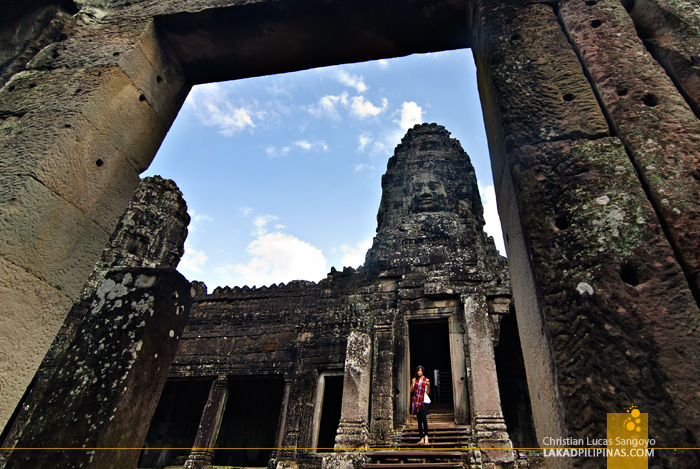 It was almost sundown as we descended the stone steps of Prasat Bayon and proceeded to find our tuk-tuk driver, Nga. 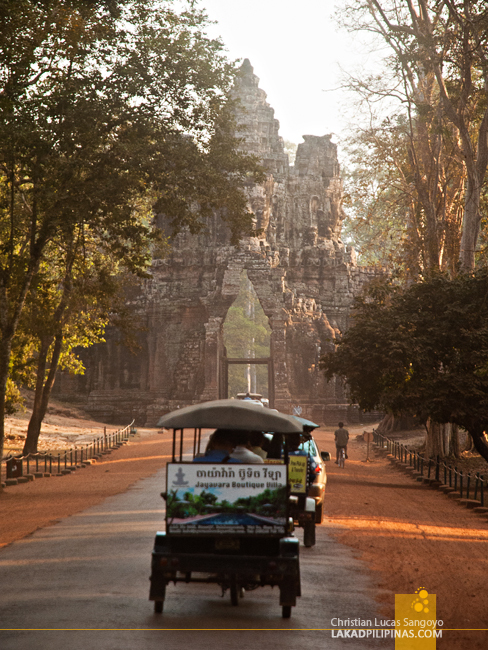 We roared through the beautiful afternoon roads of Angkor Thom, the sun glinting through the towering tree tunnels. We passed the ancient city gate, thundered along the hundred-meter long moat bridge, images of giant stone figures of asuras and devas whizzing pass. Finally it was time to sit back and relax. 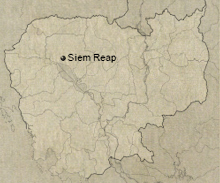 My buddy asked me, if there’s one place I would want to go back to in Siem Reap, what woudl it be. It’s a no brainer, I told her, we just left its gates a few minutes ago.